Modular Dispensing Systems offers Modu-Light self-illuminating cup-dispensing cabinets. No electrical power is needed to turn these lightweight, yet sturdy and durable panels into glowing, custom-décor accents. The cabinets come complete with one color panel of choice—red, orange, yellow, green or blue—and emit light for the life of the unit. Only 8 inches wide, they can fit in small areas at your beverage stations and are available with or without condiment compartments. Dr. Smoothie 100-percent crushed fruit smoothie concentrates meet the USDA's 100-percent juice claim and provide more than three servings of fruit per 16-ounce smoothie. These shelf-stable purees made without corn syrup are all-natural, fat-free, and vitamin- and mineral-fortified. Nature's Nutrients are whole food supplements that are cold-processed for optimum enzyme activity. Vegan, gluten-free and non-dairy blends are available. Bio Bars are cold-processed raw whole food nutrition bars that are high in fiber and contain 18 amino acids and 70 antioxidants. Soy-based mochas, vanilla concentrates and chai tea complete the line. Electro Freeze now offers two models of Granita frozen-beverage freezers. Pictured is the two-bowl G102F with fast-freeze capability. It also is available in a three-bowl model. These provide the operator the capability to produce a wide variety of frozen beverages. From smoothies to slush and frozen coffee drinks to cocktails, these freezers offer high-profit-margin frozen beverages for your operations. Electro Freeze and its nationwide distributor network are ready to support you with all your frozen-treat needs. Polar Leasing offers refrigeration rentals for large and small events, emergency replacements, and nearly any situation that calls for portable refrigeration. Coolers and freezers are both available for short- and long-term rentals. All units are delivered pre-assembled and ready to operate with a simple electrical connection. More than 200 units are available in various sizes and temperatures as freestanding or trailers. All rentals are manufactured by Polar King International, Inc. and are made specifically for outdoor use. They feature 100-percent seamless fiberglass interior and exterior construction, along with standard security measures. Star Manufacturing's peristaltic dispensers provide a safe and efficient solution to dispensing hot viscous food products such as chili, cheese sauce, gravies and hot sauces from aseptically packaged disposable pouches. The dispensers have an adjustable electronic temperature control for perfectly warmed products every time. The patented heating and pumping system provides safe, efficient and consistent dispensing. Available in single or double units, the dispensers come with or without portion control for your specific serving needs. Designed to run 24/7, they hold the product at a preset temperature using a patented forced-air heating system to ensure food safety. One of the world leaders in frozen dispensing equipment, Taylor Company offers the Model C903, a totally automatic, two-flavor frozen-beverage system. Simply add ready-to-use (RTU) or concentrated (up to 5:1 ratio) liquid mix or replace the bag-in-box syrup when empty. Completely self-contained, the bowls automatically fill from the lower refrigerated cabinet. The dispenser is capable of handling a wide variety of dairy and nondairy products such as frozen cappuccino, fruit-based or noncarbonated fountain syrups. With double the capacity of many visual display freezers, the Model C903 is an effective choice for higher volume applications. 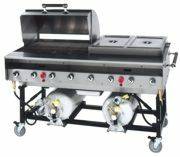 The stainless-steel Porta-Grill® represents a first in state-of-the-art design and technology. It's one of the only grills of its kind to be both UL Design Certified to ANSI Z83.11-2002 Standard for Gas Food Service Equipment and certified by NSF to ANSI/NSF Standard 2, 4 and 7. In addition, its handling weight is only 176 pounds. It folds up in minutes and stacks four high for easy storage and transport. Stainless-steel radiant guards mean no lava rock is needed, and its dual ignition system requires no matches. The unit includes two 40-pound propane cylinders with overflow protection devices. The Lil' Orbits Model 1200 mini-donut machine is an effective addition to any concession operation. Mini-donuts are inexpensive to produce and offer customers an excellent value. Because the mini-donuts can be made automatically in front of customers, their aroma, action and taste make them an instant, profitable hit. Lil' Orbits mini-donut machines are portable for quick and easy setup and carry a lifetime equipment guarantee. Lil' Orbits and Orbie brands are recognized in more than 90 countries, and a full line of supplies is available worldwide.